Sourdough bread is a huge favorite in our house. I’ve played with recipes over the years, adapting my mom’s recipe to be lower fat and lower calories (substituting applesauce for oil and Splenda for sugar), and adding in whole wheat flour (up to 50% typically doesn’t affect the rising). But earlier this holiday season I went in search of a new recipe that could be made in one day rather than over two because, frankly, spending 2 days on bread is a lot of work and doesn’t always fit into my schedule. So I stumbled across this recipe at allrecipes.com and adapted it. I already had my own starter, which I simply had to take the time to double in order to have enough, as this recipe calls for 2 cups of starter rather than the one I was accustomed to. But there’s no “cheating” by adding fresh yeast as a leavening agent. Rather than maintaining an enormous 2 pint jar of starter, when I get ready to feed the starter and bake, I stir the starter well, dump 1 cup into my 4 cup glass measuring cup and then feed each batch of starter with 1 cup of warm water (100-110 degrees F), 3 Tbsp sugar, 3 Tbsp instant potato flakes. I then cover the measuring cup with some plastic wrap and let it do its thing. A few hours later I’ve got happy, active starter for bread. 1. To the starter, add enough warm water (100-110 degrees F) to make 3 1/2 cups of liquid. Add to a large non-metal bowl. 3. Stir with a wooden spoon until ingredients come together to form a soft dough. Depending on the humidity in your region, the dough is liable to be very moist. That’s okay. Do not knead (this is my favorite part of this recipe, as I hate kneading). Set in a warm place to rise until doubled, about 1 1/2 hours. 4. After the dough has doubled in size, punch it down, but again, don’t knead. In my experience, the dough is going to be very moist and sticky at this stage. I normally take about 1/2 cup of flour to sprinkle down over the dough as I divide it in half. I take each half of the dough and set it in a greased and floured loaf pan, then set it to rise another half hour. Remember to preheat your oven to 350 toward the end of that half hour. 5. Bake loaves at 350 degrees for 10 minutes. Brush the tops of the loaves with cold water. Bake another 35 minutes then remove to wire cooling racks. 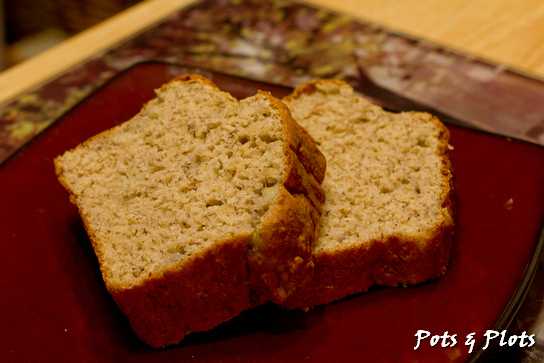 This recipe makes 2 very moist, dense loaves of whole grain bread. My husband–the picky eater–declares he likes this better than my regular (i.e. non-wheat) sourdough, so that’s high praise indeed. It’s fabulous served with stews or simply with a little bit of margarine when fresh from the oven. Feel free to experiment with the flours. There are a lot of different types of flour out there–I’ve added in brown rice flour with good results. Please be aware that the more whole grain flours you add in place of regular white bread flour, the less the loaves seem to rise. This may depend on your starter, but that’s been my experience. We don’t do a lot of sandwiches in our house, so that’s okay with us. If you find a combination of flours you like, check back in and let me know! I’m always up for experimentation.